Our day’s plan went out the door at the crack of dawn yesterday. 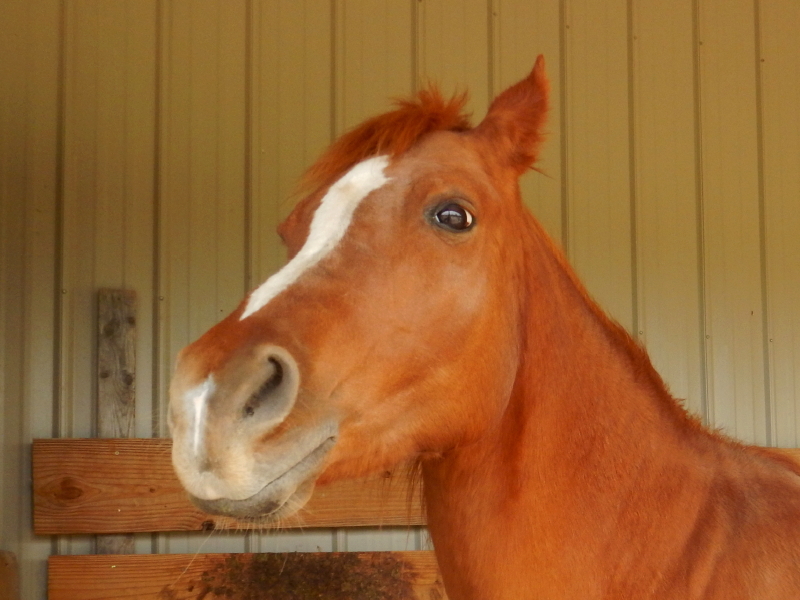 Does this look like the face of a mare who doesn’t want her picture taken? Poor Dezirea is fighting a bug, we think. We didn’t notice anything amiss until serving up the pans of morning feed. Dezi had no interest. It was at that point that plans for the day were scrapped and caring for our senior mare became the focus of our energies. She was not a happy horse, but at least she didn’t appear to be in extreme pain. After running through our basic knowledge of diagnostic steps, Cyndie wanted to consult with the veterinarian. He felt it warranted a visit so he could do an in-person assessment. I kept Dezirea walking, which she did so amicably enough for someone not really interested in doing anything. Her temperature wasn’t alarmingly high, but her pulse was definitely elevated. We had immediately quarantined her to the small side of our paddocks and emptied that box of hay. As the day wore on, I noticed the other three horses had deposited two piles of poo each, but Dezirea had none. Was it a digestive issue or some other affliction? Hard to tell. The vet took a blood sample. He believed the problem might be a tick-born infection, anaplasmosis. We are treating it as if, and they administered an intravenous antimicrobial. This morning, she is at the very least, no worse in appearance. She is rather lethargic, though much less depressed. She seems to be gaining interest in eating, although we are hesitant to provide full rations until we see proof her system is functioning more normally. We found evidence she was able to expel a small amount of poop overnight, so that provides some reassurance that she doesn’t have a catastrophic twist or obstruction shutting down all function in the digestive system. That also matches with her lack of acute pain symptoms. So, looking after Dezirea consumed most of our mental energies yesterday. I turned piles of manure while spending extended time with the horses. 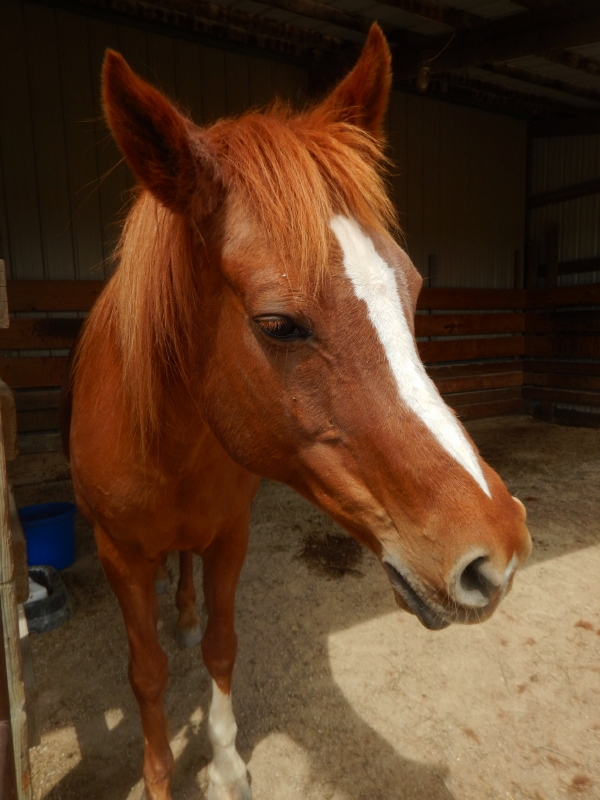 The other horses tolerated the altered accommodations with only minor complaint. The hours and minutes passed in a blink and accomplishments dropped to bare essentials. The big milestone that became overshadowed by Dezirea’s illness was the delivery of much-needed hay to rescue us from a predicament. Jack and Joanie were gracious enough to make a long trip from Minnesota to bring us hay because our sources here had nothing left to offer. Their precious energy lifted our spirits and provided liveliness that was particularly helpful in the moment, and their hay will help us greatly for the weeks ahead. Hunter thinks he has an easy solution to the hay shortage. He desperately wants us to open the gates and let him have at the sweet green grass growing everywhere in sight. It’s like, water, water everywhere, and not a drop to drink. If he only recognized the risks. We could use a break from horse health issues. For now, I’m making no plan for the rest of today. Whatever comes up will get my attention. Hopefully, it won’t interfere with the guests and dinner Cyndie has planned for this evening.